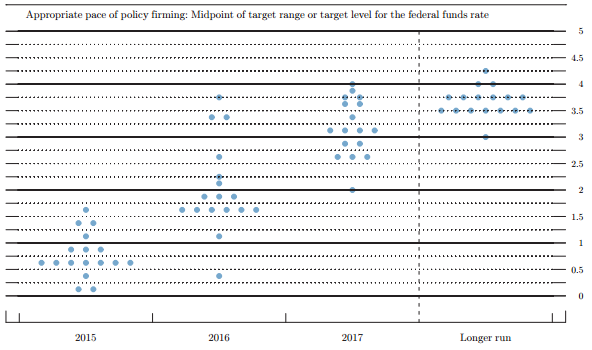 Following on from the first part of my June FOMC preview yesterday (here), this post looks at the likely changes to the statement, economic projections and interest rate ‘dot’ plot. Information received since the Federal Open Market Committee met in MarchApril suggests that economic growth has rebounded somewhat slowed during the winter months, in part reflecting transitory factors. The pace of job gains has picked up moderated, and the unemployment rate has remained steady. A range of labor market indicators suggests that underutilization of labor resources diminished somewhat was little changed. Growth in household spending rose modestlydeclined; households’ real incomes rose strongly, partly reflecting earlier declines in energy prices, and consumer sentiment remains high. Business fixed investment is advancingsoftened, while the recovery in the housing sector picked up, remained slow, and export growth has reboundeddeclined. Inflation continued to run below the Committee’s longer-run objective, partly reflecting earlier declines in energy prices and decreasing prices of non-energy imports. Market-based measures of inflation compensation remain low; survey-based measures of longer-term inflation expectations have remained stable. To support continued progress toward maximum employment and price stability, the Committee today reaffirmed its view that the current 0 to 1/4 percent target range for the federal funds rate remains appropriate. In determining how long to maintain this target range, the Committee will assess progress–both realized and expected–toward its objectives of maximum employment and 2 percent inflation. This assessment will take into account a wide range of information, including measures of labor market conditions, indicators of inflation pressures and inflation expectations, and readings on financial and international developments. The Committee anticipates that it will be appropriate to raise the target range for the federal funds rate when it has seen further improvement in the labor market and is reasonably confident that inflation will move back to its 2 percent objective over the medium term. The most likely change to the economic forecasts will come in the form of a lower 2015 GDP projection. The weak Q1 (and so far somewhat disappointing bounce-back in Q2) will be enough to revise down year-end forecasts. Inflation may be revised up a little this year as well, with core PCE of around 1%. More interesting though will be whether there is any upward revision to the median core inflation projection for end-2016. It was revised down sharply in March, to 1.7% (see here for my reading of the March projections). That seems inexplicably low to me, and I wouldn’t be surprised to see some movement up (maybe a couple of tenths). 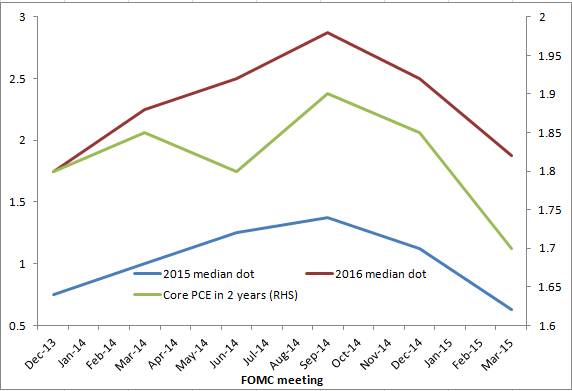 There has been a pretty good relationship between changes in the inflation outlook and the median FOMC interest rate dots. Would a move up in the inflation projection see the median dot also move up? On this occasion I doubt it. The 2015 median of 0.625% is unlikely to change, although some of the dots will move down (reflecting the later lift-off). That would still imply two hikes this year, around one more than the market currently has priced. The 2016 median is in danger of coming down from 1.875% to 1.625%, as it would require only one dot to move down, something that is quite plausible for those who envisage roughly 25bp of hikes per qtr, now starting in September. I expect 2017 and the long-run to remain unchanged.